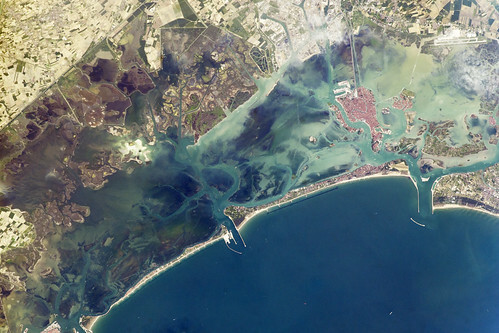 A narrow barrier island protects the Lagoon of Venice from storm waves in the northern Adriatic Sea, and breakwaters protect inlets to the lagoon. Red tiles on the roofs of Venice contrast with the grays of the sister city of Mestre, and the cities are joined by a prominent causeway. What appears to another causeway joining the island to the airport (top right) is actually the combined wakes of many boats and water taxis shuttling between them. Small, bright agricultural fields on well-drained soils (top left) contrast with the darker vegetation of back-bay swamps, where fishing is a popular pastime. Astronaut photograph ISS039-E-19482 was acquired on May 9, 2014, with a Nikon D3S digital camera using a 400 millimeter lens, and is provided by the ISS Crew Earth Observations Facility and the Earth Science and Remote Sensing Unit, Johnson Space Center. The image was taken by the Expedition 39 crew.